When MWiB was launched in July 2011 it was decided to wait and allow a new logo for the movement to emerge. Initially, the new movement continued to use the logos of its constituent parts, Women's Network in the Methodist Church and the World Federation of Methodist and Uniting Church Women. After discussion, prayer, consultation and, eventually, taking ideas to a professional graphic designer, Sally Bamford www.little-betty.co.uk several designs were submitted to the MWiB Forum meeting in March 2013 and this enchanting, clever butterfly was selected (formed from the letters MWiB, gathered around the cross). The butterfly image represents aspects of our Christian belief. The life cycle of the butterfly has four distinct stages. One day a young woman came across a chrysalis and saw that it was just beginning to open. She decided to help the emerging butterfly on its way and so prised open the chrysalis. The butterfly emerged but its wings could never function. It had needed the time of struggle in order for the wings to be fully formed. We are sometimes tempted to try and force God’s hand. In our impatience, we forget that we learn from perseverance. ...and to link with Methodist women around the world, in prayer, exchanging news and face to face meetings. Methodist Women in Britain (MWiB) is an umbrella organisation for any women - individuals or groups – who would like to be connected and to share resources and ideas. We operate through a small executive committee and a Forum, with representatives from each district in British Methodism. MWiB was launched at the British Methodist Conference in Southport on Friday 1st July 2011. It includes the Women’s Network in the Methodist Church, the British Unit of the World Federation of Methodist and Uniting Church Women, and lots more besides. Whilst still remaining part of the British Methodist Church, MWiB will be run independently by volunteers, managing our own finances. Methodist Women in Britain seeks to work in partnership wherever possible. Some of our partnerships are long standing relationships developed by women in Methodism, others are newer associations. Women's World Day of Prayer"
Report from Leeds Spring Meeting 2018 held on 16-18 February. Again it was a joy and privilege to be with the other Forum representatives from around the Connexion and with the Executive committee. We learned of what was happening with various projects and legacy gifts: how it was thought the latter were to be best used. We received reports from conferences both in this country and around the world and District news. We spent times of quiet reflection and prayer seeking guidance on particular tasks we were engaged in at the time and we shared worship sessions throughout the three days - and lots of laughter, food and friendship. Normally we arrive in time for dinner on the first evening and then socialise for the rest of the evening so that we are ‘ready for business’ the following morning. On this occasion, however, there was so much business to be dealt with on the agenda we had our meal at 7.30 and then went straight into the first presentation and report. In my last report I spoke of a partnership between MWiB and Touchstone in Bradford. Touchstone is a 'listening community' with the vision of making safe places of hospitality where people with radically different cultural backgrounds can be together and listen to each other. Touchstone has worked alongside diverse communities for 25 years. The Touchstone Centre is sponsored by the Methodist Church in Britain and is open to all. The Revd. Barbara Glasson spoke of the current work of Touchstone and thanked MWiB for our financial support for their building project. A letter of understanding between MWiB and Touchstone was signed by our President on behalf of MWiB and by Barbara on behalf of Touchstone. Go! with someone else or on your own, to take a walk or make a change. She suggested this can be done within your churches and communities or even better on a train, in a supermarket, in a coffee shop – to be able to give someone time to talk. Please don’t let the Bristol District down and do nothing about this. It would be good if all nine Circuits sent at least one ‘story’ to Touchstone. Details of this are on a separate attachment. Visual impairment - £24,665 available – churches, Circuits or Districts should email [email protected] to submit claims for suitable projects. Hearing impairment - £60,242 available – churches, Circuits or Districts should email [email protected] to submit claims for suitable projects. MWib is considering arranging an initial meeting to determine the scope of work for a new task group which may include training on clear speaking, technological solutions and awareness-raising. You will be interested to hear that Carolyn Lawrence, World Federation Officer, (she is leading our Lindors Experience in March) has been in South Africa on a World Church visit with Rachel Allison and they have been staying with our Mission Partner, Jane Day. They have been pas toral visiting, leading Bible study, visiting learning opportunities and sharing in worship. WWDP – By the time you read this newsletter you will all have attended this year’s Service, All God’s Creation is Very Good, written by the women of Suriname. The 2022 service is to be written by the women of England, Wales and Northern Ireland. A writing team is being recruited of approx. 40, including a significant proportion under 35 years of age. There is also currently a consultation on a possible change of name to World Day of Prayer. Swanwick Residential Weekend this year Friday 20–22 April ‘Oceans of Justice, Rivers of Fairness’ [Amos 5] Keynote Speaker: Rachel Lampard. A few places still available. Two venues, Truro Methodist Church, Cornwall and St Paul’s, Blackburn, Lancashire. Programme to include worship, Bible study, keynote speaker, workshops, two-course lunch. The timing of connexional quarterly mailings will in future be October, February, May and August. Prayer diary dates will be adjusted accordingly, so the next mailing will repeat March’s prayer diary. Also in a separate attachment you will see a sheet of paper entitled ‘Leaving the Familiar’. This has been put together by the Connexional Team following some excellent creativity days. It was felt that Districts, Circuits or individual churches may find it helpful in organising a day to bring people together. Touchstone; Creativity Day ; Writing Competition flyers; Annual Review. I have given one copy of each of these to Circuit reps. but further copies can be obtained through the website. Finally may I encourage you to make yourself a coffee, sit in front of your ipad or computer, and browse the web site of MWiB www.mwib.org.uk – it’s well worth a visit. Carolyn Buley, Bristol Methodist District MWiB Forum Representative. Cathy with other members of the team at the half-way point. This year's annual sponsored walk around Prestbury Park Racecourse to raise funds for MWiB took place on Saturday 9th June. 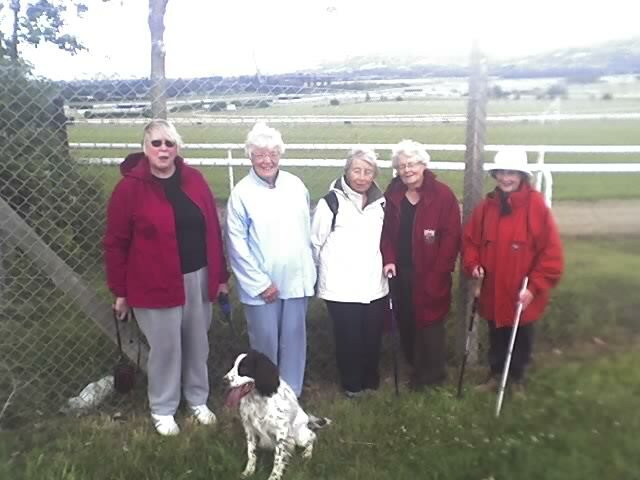 The small team of 4 ladies representing Bishop’s Cleeve, Cheltenham and Tewkesbury Methodist churches MWiB, plus one man and his dog, completed the walk. As you can see from this photograph, the Racecourse was hosting a festival so we had music to accompany us during the walk.The weather was also warmer than last year. The generosity of the people sponsoring Cathy Bailey continues and Bishop’s Cleeve raised over £176. Cathy once again, thanks all those kind people who sponsored her for this walk. The team raised £490 for MWiB funds. The Women's Network of the Methodist Church aims to encourage, enable and equip women to participate fully in the life of the Church and in society. Cathy and Alice with other members of the team at the half-way point. 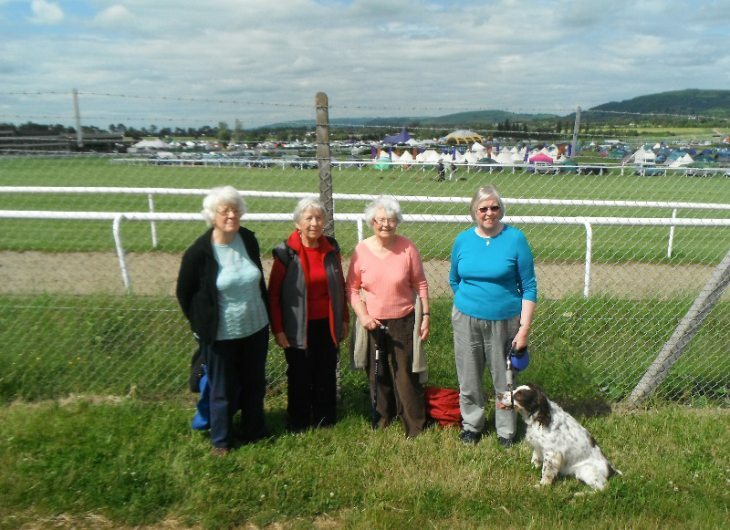 On Saturday 18th June, a small team of 5 ladies representing Bishop’s Cleeve, Cheltenham and Tewkesbury Methodist churches Women’ Network, plus a man and his dog, completed their annual sponsored walk around Cheltenham racecourse to raise funds for Network. This year Bishop’s Cleeve raised over £220. Once again, thank very much to those kind people who sponsored Cathy Bailey, who, as always, is grateful for your generosity. The amounts from the other churches have yet to be finalised.